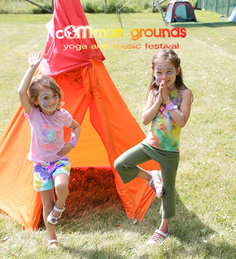 cOMmon Grounds Festival is a family fun event for all ages. Our program is designed for "Young Yogi's" between the ages of 4-12. Our Kids Camp is held on-site and offers fun activities throughout the day. Activities and crafts are designed to fit your child's age. Our program is organized and ran by teachers, moms and professionals within the cOMmunity. Our Kids Camp is free for all children with a purchased ticket, pre-registration is required. * Preregistration is required so we can ensure there are enough supplies for all little yogi's.